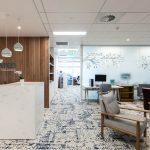 IA Design were engaged as lead designer by WA’s largest energy provider, Synergy, to deliver a collaborative and flexible workplace spanned over seven floors. 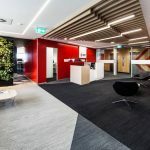 The IA Design team were tasked to provide a sense of connectivity and consistency between Synergy’s business units, which were separated over seven floors. Each floor had a colour theme which transposed from the Synergy’s Retail and Corporate branding colours. This continued through to the wall and glazing graphics which work to make the end users feel a strong connection as they move through different floors. Flexibility was the key driver and clear aspiration for the client. A flexible space that could grow and shrink with ease to suit the ever changing project groups. One where the end user could easily change the environment to suit its needs with minimal outside assistance. This was predominantly achieved through the Project Meeting rooms and workstation configuration. For each project room an additional 6-8 work points could be easily configured. For each bank of 3 desks at 6000mm long, an additional work point could be accommodated without any contractors or consultants involved. Many months of client engagement included a number of client teams in the design process. A team of around 10 people were nominated as spokespersons for their departments, these were known as the Design Champions. These champions were the conduit for sharing the staff’s requirements and desires, and communicating back to the groups so that staff were informed, engaged in the design process and had strong ownership of the final outcome. A good working relationship and mutual respect between the Project Manager, Engineer, Acoustic consultant, Building Owner, Building Manager, Building Owner’s Architect, Tenant Advocate, Graphic Designer and Interior Designer from the onset of the project in January 2015 made achieving the client’s never changing brief and aspiration for the new home of Synergy easy to achieve. The fit-out exceeded expectations and provided Synergy with a contemporary, industrial and flexible environment.